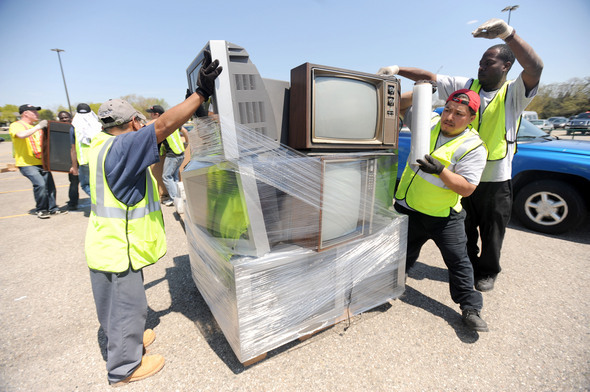 Posted on Sat, May 7, 2011 : 4:12 p.m.
Good Helpers Moving Services employees Flavio Barenca, left, and Ken Tyree, right, hold a pile of televisions while Hilario Vazquez wraps them with plastic during an electronic waste recycling event Saturday hosted by the University of Michigan and Ann Arbor Public Schools at Pioneer High School. Old television sets of all varieties dominated the items discarded at today’s free e-waste recycling event in Ann Arbor. Residents dropped off enough stuff to set a record at the fourth annual event, held at Pioneer High School, filling 21 vans for a total weight of more than 250 tons of recycling, about 5 more tons than last year, organizers said. That’s a lot of CD-ROM’s and old computer mice. Other popular discarded items included printers, VCRs, cassette players, and monitors. 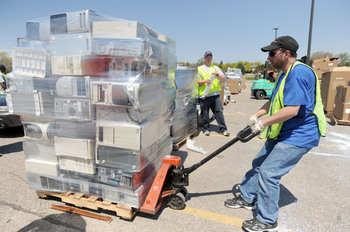 The purpose of the mass recycling event is to recycle electronics responsibly. Good Helpers Moving Services employee Shawn McCoy uses a hand forklift to move a pile of computers. Everything dropped off today will be recycled. It’s all going to Chicago, thanks to an anonymous global company that’s footing the bill. Huge shredders grind and separate the materials and nothing ends up in a landfill. MaryBeth Stuenkel was among the volunteers helping today from the University of Michigan. She works for IT Services, and is working on a more sustainable computing program at the university. Suzette Bouchard arrived with a full vehicle. She was relieved to be parting with old computer equipment. According to Hagan, today’s recycling event brought in the most recycling in its four-year history, with 4,000 vehicles participating in the dropoff. Lisa Carolin is a freelance reporter for AnnArbor.com. Sun, May 8, 2011 : 10:58 p.m. I'm with ConcernedCitizen, for the past three years I have heard about the event AFTER it happens. I have several electronics that are just sitting taking up space because I won't dump just to dump and want to verify that the information stored is properly deleted! Mon, May 9, 2011 : 2:10 p.m. I actually heard about this thru Ann Arbor Public Schools emails. If you have a child in one of their schools? You will be in the know. I couldn't due to other things going on in life. Sun, May 8, 2011 : 2:56 p.m.
Why not publish an article that *announces* that this event is coming?? How I wish I would have known about it! Sun, May 8, 2011 : 9:23 p.m. There was an article about it beforehand. Something like &quot;Hoarding Defunct Electronics...&quot;. Sun, May 8, 2011 : 2:22 p.m. There is a local computer shop in Ypsilanti that will take the old computer stuff for free. What concerns me is the hard drives. You have to remember this. What is on those hard drives? Can come back to haunt you because those things, even if you delete everything? Still have a way of being surfaced and used against you. Like bank records, social security numbers and stuff like that. What I do is take a magnet and use that one. Otherwise, I hate to say it, my hard drive ends up in the land fill. I do not want hackers and thieves stealing my identity. Good luck if you didn't. Otherwise, great idea, too bad they don't enlighten the public about what can happen to your hard drive. Sleep well tonight for you may be someone else tomorrow. Mon, May 9, 2011 : 2:11 p.m. So in other words, take out the hard drive and dump it in the land fill. It will be found a long time after you are dead. Then they can pretend to be you. Sun, May 8, 2011 : 2:45 p.m. I should tell you from someone with a background in computer science and physics, your magnet will not work on modern hard drives. Modern hard drives are built with paramagnetic resistance to prevent corruption from endogenous magnetic fields. I do agree, one should perform a secure wipe of the hard drive before disposal. A secure wipe is more than just erasing the data, but including a random data write. Sun, May 8, 2011 : 1:29 p.m. While shredding and recycling is better than nothing, I think re-use and re-purposing is better. With this thought in mind, I stood outside the event with a sign saying &quot;wanted laptop computer&quot;. Mind you that I did not interfere with this event in any way. The project coordinator came up and threaten me with arrest if I didn't leave right away. He said I could not even stand on the public sidewalk. Here is a business from Chicago, using the parking lot from a school I pay taxes to support, presumably for free, telling me I can't reuse, I can't be on the school parking lot, and I can't even stand on the sidewalk in front of the school., and calling the police on me. Something stinks about this &quot;recycler&quot;. Shame on the Ann Arbor police for supporting this questionable organization. Sun, May 8, 2011 : 2:26 p.m. They had no right to threaten you. You can stand on public property without being threatened and arrested. Remember that article about being banned from UM? Again, I say, stand your ground. They can't touch you. I agree with your post. Should have been arrested. Lets see what really happens to those hackers from Chicago. Don't think they will ever come back to Michigan again. Now that I think about your post? I wonder how many identities have been stolen today? Sun, May 8, 2011 : 4:16 a.m.
Well the AA socialists can sleep well tonight as their garbage magical turns into pixie dust as seen here; <a href="http://www.wasteplan.co.za/lang/en/research/" rel='nofollow'>http://www.wasteplan.co.za/lang/en/research/</a> Of course they could try living like the rest of us that pay their $250,000 teaching salaries thru taxpayer funded grants, credits, federally funded &quot;research programs&quot;, tax free endowments... but then they'd have to make do with using electronics that may be more than a couple years old and that would slow down the pixie dust production. What will tinkerbell do then? Sun, May 8, 2011 : 3:14 p.m. I will sleep well at night because they don't exist. There is a major difference between administration, educators, and university researchers. Only the top medical school researchers at the University of Michigan earn $200,000+. They deserve it based upon the funding they bring into the university. Sleep well tonight because there are. Sun, May 8, 2011 : 1:33 p.m. I do not know which version of reality you live in, but there are no teachers earning $250,000. Hell I am an educator and I would love to earn more $35,000 or even earn a grant, research program or endowment. This post is yet another example of the right wing sheep regurgitating the garbage they hear on right-wing talk radio. Sun, May 8, 2011 : 2:36 a.m. Fundamentally, the city or county should institute a free return policy on any electronic waste because it ends up in the dumpsters all around town. I've seen people throw away monitors, old tv sets, fax machines, appliances, computers, fluorescent tubes (contain mercury and broken tubes raise mercury exposure threshold levels to dangerous levels to anyone else using the dumpster.) etc. People by and large are responsible and events like this prove it, but the fees at recycle centers guarantee illegal dumping of hazardous electronic waste by the cheap and the lazy. Sun, May 8, 2011 : 1:43 a.m.
Another happy customer here, we unloaded a printer and a DVD player, it took just a couple of minutes, and all the volunteers were very friendly. Sun, May 8, 2011 : 1:33 a.m.
Great event...so well organized, if only our government was this organized we be getting somewhere up in Lansing. Sun, May 8, 2011 : 1:59 a.m.
By government, you mean of course the Lansing-sponsored University of Michigan? Or the public government Ann Arbor Public School district? You know... the organizers of the event? Sat, May 7, 2011 : 11:22 p.m.
A well oiled e-waste machine. Sat, May 7, 2011 : 10:14 p.m. I agree, this was a great event! We were able to unload two huge, old televisions. Traffic in the parking lot moved smoothly and quickly, and we were in and out in a few minutes. Great job, everyone! Sat, May 7, 2011 : 8:47 p.m. Many thanks to the people who do this every year! We got rid of a van-load of stuff! Sat, May 7, 2011 : 8:20 p.m. This was a wonderful event. They were extremely well organized and had us out of there in less than fifteen minutes. Congratulations to all involved for doing such a great job!